Are you planning to move Canada either temporarily or permanently? Got confused in choosing a best Canadian visa that suits your visit purpose? Well, this article gives you a complete overview on some of the major Canadian visas. Canada, as a land of rising opportunities allures a number of immigrants from all over the world who seek better career opportunities. Every year a number of people migrate to Canada for various reasons such as education, sightseeing, business, employment and others. The type of visa they need to apply depends on their purpose of visit to Canada. The government of Canada has introduced several visas to entice overseas nationals to come to Canada for various purposes. The following are the some of the major Canadian visas that enables overseas nationals to migrate to Canada either temporarily or permanently. This is one of the best visas to Migrate Canada, which came into force on 2 January 2013. Canada Federal Skilled Worker visa is a permanent resident visa that enables skilled overseas nationals to reside and work in Canada permanently. It is a point’s based system where an individual must secure 67 points out of 100 points. Quebec, a province in Canada has its own Canada skilled immigration rules and regulation in screening eligible candidates. Quebec Skilled Immigration program entitles overseas nationals to apply for permanent residence visa. 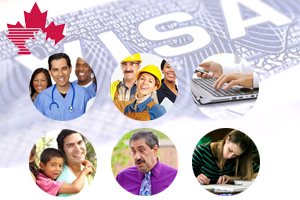 Individuals need to undergo points based system successfully in order to obtain a Canada Quebec Skilled Worker Visa. The Canada Provincial Nominee Program is designed to welcome overseas skilled employees to settle in Canadian provinces. Immigration to Canada under Canada Provincial Nominee Program offers permanent residency for overseas nationals. It is not a point based system; however, individuals need to meet certain requirements in order to migrate to Canada under the Provincial Nominee Program. In order to apply for Canada visa under this program applicant need to be nominated by a Canadian province or territory. Canada Work Permit is a Canada temporary visa, structured for overseas skilled employees who hold a valid job offer from the employer in Canada. Work Permit to Canada enables overseas nationals to reside and work in Canada till the job offer is valid or employment agreement is intact. Canada visit visa is a short term visa that enables overseas nationals to enter and reside in the country for a maximum period of six months. Canada visit visa is granted for the overseas nationals for the purpose of the sightseeing and visiting friend or family members. If individuals are planning to study in Canada for more than six months they need to apply for a Canada Student Visa. During the duration of course individuals can also take up employment and work in Canada without a work permit. However, applicants need to meet some basic requirements in order to obtain Canada student visa.